Paint Store :: Shop by Brand :: American Safety Razor :: AMERICAN LINE 65-0214 AUTOLOAD RETRACTABLE KNIFE. 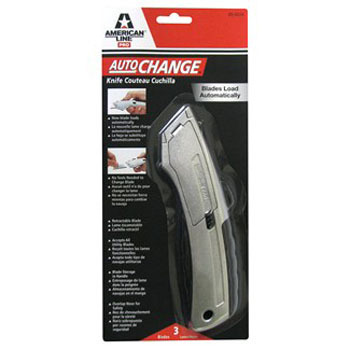 AMERICAN LINE 65-0214 AUTOLOAD RETRACTABLE KNIFE. Auto Load Design for easy blade changes. Fully retractable design. TPR Grip for a sure hold. Handle holds five blades in the loading chamber. AMERICAN LINE 66-0362 EXTRA-KEEN SINGLE EDGE BLADE SIZE:.009 PACK:100 PCS. MAJIC 39102 8-1510 DIAMONDHARD ACRYLIC ENAMEL NAVY GRAY GLOSS SIZE:QUART. 3M 421-080 2.25" X 5.75" 80 GRIT SANDBLASTER DETAIL FLEXIBLE PAD PACK:8 PCS. 3M 8271 P95 PARTICULATE RESPIRATOR WITH VALVE & FACESEAL PACK:10 PCS. WOOSTER 4153 ULTRA/PRO LINDBECK EXTRA FIRM ANGLE SASH BRUSH SIZE:1.5" PACK:6 PCS. RUSTOLEUM 7992830 SPRAY GRAY STONE AMERICAN ACCENTS STONE TEXTURED SPRAY SIZE:12 OZ. SPRAY PACK:6 PCS.